Take a shared approach to compliance in the cloud. 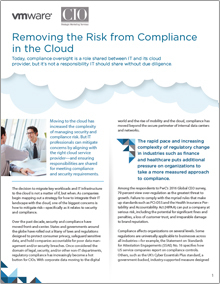 Learn more in the white paper Removing the Risk from Compliance in the Cloud. Moving to the cloud has increased the complexity of managing security and compliance risk. But IT professionals can mitigate concerns by aligning with the right cloud service provider—and ensuring responsibilities are shared for meeting compliance and security requirements. Read this white paper to learn how you can remove the risk from compliance in the cloud. Discover how Kunstmaan increased their business flexibility and scalability, by leveraging VMware technology with the help of VMware Cloud Provider™.